If youâ€™re planning on buying a second-hand car, there are a few pertinent questions you have to ask the seller. Neglect to do so and you might not discover important information regarding the condition and the history of the car. This will never be that the seats conveniently fold away â€“ itâ€™s more likely to be that the radiator packs up every two months and that the oil leaks. Very few people will be honest with you and tell you that theyâ€™re selling the car because of a fault. But at least if they say itâ€™s because theyâ€™re relocating to another country, youâ€™ll know itâ€™s an urgent sale. This means the seller is more likely to negotiate the price. Similarly, if the sale is from an estate, for example, you can know that the seller isnâ€™t necessarily trying to get rid of the car in a hurry. Youâ€™ll then not be in for an easy ride when it comes to quibbling over the carâ€™s price. You should ask this question before you go to view the car. Then do some research to see what other used cars in the same range are going for. Youâ€™ll see very quickly if the asking price is fair or not. Who owned the car before you? The ideal answer will be â€˜no-oneâ€™. A car with more than one previous owner is likely to have more problems than any other car. If the seller was the only owner, ask them how long theyâ€™ve had the car for. If they say a year or two but the odometer is running into hundreds of thousands of kilometres, you can bet on the fact that they’re lying to you. Does the car have any special features? Fittings like leather seats, an on-board GPS or air-conditioning all affect the price of a car. A vehicle with none or standard features should be selling for less than other cars. Have you replaced or upgraded anything lately? Replacements tell you whether you would need to spend money on new items, like tyres, in the near future. As far as upgrades are concerned, make sure that they are of use to you. There is no point in spending money on a car fitted with fancy gadgets that youâ€™ll never use. Can I see the VIN number, vehicle registration and your identification? To check that the seller is in fact the owner of the car youâ€™re interested in, cross-reference the information from these documents to verify that they match. If youâ€™re not buying the car from the rightful owner, youâ€™ll create a mountain of problems for yourself that will take ages to clear up. Any seller should be more than happy to present you with the carâ€™s service history, because it will prove that they looked after the car well. A seller thatâ€™s hesitant or unwilling to produce these documents are definitely hiding something. You absolutely have to take the car for a test drive. Itâ€™s the only way youâ€™ll discover faults that only become obvious when the car is switched on or in transit. 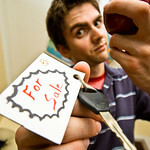 If the seller denies you a test drive, politely thank them for their time and move on. Something is definitely amiss. Only once youâ€™ve gotten all the desirable answers and have taken the car for a test drive, should you start thinking about applying for private vehicle finance. You donâ€™t want to spend time or money on a vehicle thatâ€™s not going to be worth your while. Terrence is a long-time writer and researcher, and likes to share information that makes a difference in the everyday lives of others.